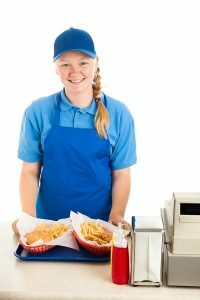 For employees who work for a “fast food establishment”* the minimum wage has gone up from $10.50 to $12.00 per hour. It will increase again by $1.50 per hour in both January 2018 and 2019, when it will reach $15.00 per hour. For other employees in New York City who work for businesses with more than 10 employees, the minimum wage has increased from $9.00 to $11.00 per hour. It will go up to $13.00 hour in January 2018 and to $15.00 per hour in January 2019. For employees in New York City who work for businesses with 10 or fewer employees, the minimum wage has raised from $9.00 to $10.50 per hour. It will increase by $1.50 per hour each year until it reaches $15.00 per hour in January 2020. For employees who work for a “fast food establishment”* the minimum wage has gone up from $9.75 to $10.75 per hour. It will continue to rise by $1.00 per hour each year until it reaches $15.00 per hour in January 2022. For other employees working in Nassau, Suffolk or Westchester County, the minimum wage has gone up from $9.00 to $10.00 per hour. It will continue to increase by $1.00 per hour each year until it reaches $15.00 per hour in January 2022. For other employees throughout the rest of New York State, the minimum wage has increased from $9.00 to $9.70 per hour. It will continue to go up by $0.70 per hour annually until it reaches $15.00 per hour in January 2025. *A “fast food establishment” means a business that (1) primarily purpose is to sell food or drinks; (2) customers pay before they eat; and (3) is part of a chain of at least 30 locations nationally.